[PDF] FTP Uploader is an advanced program of AthTek Skype Recorder. It enables user to upload the Skype call recordings automatically to their web servers. This will help user to edit or listen to the recordings remotely. Business users of AthTek Skype Recorder will use FTP Uploader for files sharing, custom service and Skype interview. As an advanced Skype recorder, AthTek’s FTP Uploader can not only support plain FTP, but also SFTP. This means the Skype call recordings will be safely uploaded to the web server. 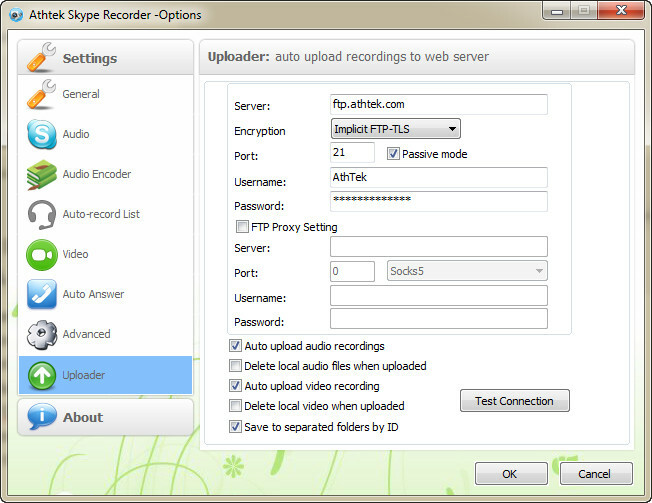 In this article, you will read how to use the FTP Uploader of AthTek Skype Recorder. 1. Login the control panel to get FTP info of your web server. If you already have a web server account, you can login to get the FTP info or create a new FTP account to the web server. If you still don’t have a web server account, you can choose one from the below list, and then you will have an FTP account for uploading files. 3. Upload Skype call recordings automatically. 2. Fill in the form in FTP Uploader of AthTek Skype Recorder. Basically, you need to fill in the web server’s address, port, FTP account username and password, then you would be able to upload the Skype call recordings directly by AthTek Skype Recorder. Sometimes business user has higher security requirements in uploading files. They can use encryption mode to upload files safely. They can also use an FTP proxy to hide the real address. If you have no idea about these options, please leave them as default. It is recommended to test the FTP connection after configuration. Maybe a Skype call now and the recording files will be automatically uploaded to the web server. You will be able to download and edit them at any time any place with an internet connection.